Keeping employees productive in a healthcare practice seems like it may be a daunting task. However, it is really quite simple, at least to say. 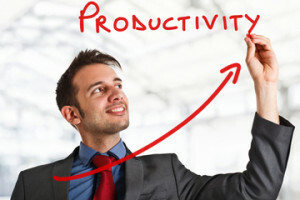 $550 billion dollars – that’s how much is lost each year due to employee lack of productivity. That’s a very big number. And what’s the problem anyway? What do employees want that they are not getting so spend time doing other things than their job? A recent survey of company’s voted best places to work say that employees want to be a part of something that will make a difference. If you really look at what this means, what employees want is to be a “part of something” not just a cog in the wheel, not just another cubicle. They want to be invested in the success of the company and that success is tied to making a difference, not just a bottom line success for someone else. So how do you, a healthcare practice, meet the criteria for best company to work for and keep cost- containment, revenue enhancing goals at the same time? You start by selecting the best employees from the pool of applicants. Turn-over is huge in healthcare and costs facilities and practices tons of money in re-training and benefit packages. Take time selecting the best candidates. I know, I know, there’s a space that needs filling, but the warm body policy is long over. Finding the right person for the job, and paying that person a little more for quality will save you so much down the road. What you are looking for is proven dependability. A person who is able to be a real team player, computer literate and mature. Experience may or may not be as beneficial as it’s cracked up to be. Ever hire an experienced person who came in and immediately began to try to run the show? They are disruptive and counter-productive. The right person can learn the skills and, if they are computer savvy, they will quickly learn your software. Give me a dependable smart person who can work with the team any day. Your culture should be a mirror of your mission statement. From the C person to the janitor, your culture should permeate everything that is done in your facility/practice. If it doesn’t, all the money you throw at issues will not help. Teaching your culture to new employees should be a primary part of their early education at your facility/practice. Investing in solutions and keeping the door always open to employee solutions keeps employees invested in your practice. Who knows better how specific workflow changes could be made to improve patient flow than the persons working in those areas? Be a patient-centric facility/practice. This is healthcare, hasn’t it always been about the patient? Sadly, the answer to that question is no. It has been about bottom lines, profit, awards, doctors and a plethora of other things. A truly patient-centric practice is where employees really understand their roles in a patients success and sustained wellness, a place that will give employees that “I am part of something that makes a difference” feeling. And that will translate to satisfied, productive employees. Want to keep employees productive and invested in positive patient outcomes? Invest in them. It really is that simple.